· WIFI FPV / LIVE FEED: It is possible to receive the images from the drone camera via WiFi connection, the videos and photos will be saved automatically on your mobile, this is very useful to edit and share them with your family or friends. · Variable and continuous speed function: designed for experienced pilots and beginners. Acceleration from 10% to 100% can be performed without problems. In addition, the gradual acceleration and deceleration can be 1% and not only allows you to fly both indoors and outdoors, but also offers you a way to practice the flight to give you the training to quickly transform from beginner to expert. · 3D FLIPS: The drone comes with another interesting feature that is a button that allows you to make 360 degree spins in the air. Stabilization: 6-axis gyroscopic stabilization makes the drone stable and easy to fly. 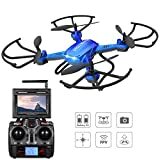 · 720P HD CAMERA AND 2 BATTERIES: The drone has a 2MP HD camera with focus, with which you get very good images, and comes with two batteries, one already put on and the other spare.